A statute is a formal written enactment of a legislative authority that governs a city, state, or country. Typically, statutes command or prohibit something, or declare policy. Statutes are rules made by legislative bodies; they are distinguished from case law or precedent, which is decided by courts, and regulations issued by government agencies. The Federal Radio Commission (FRC) was a government body that regulated radio use in the United States from its creation in 1926 until its replacement by the Federal Communications Commission (FCC) in 1934. The Commission was created to regulate radio use "as the public interest, convenience, or necessity" requires. The Radio Act of 1927 superseded the Radio Act of 1912, which had given regulatory powers over radio communication to the Secretary of Commerce and Labor. The Radio Act of 1912 did not mention broadcasting and limited all private radio communications to what is now the AM band. The Interstate Commerce Commission (ICC) was a regulatory agency in the United States created by the Interstate Commerce Act of 1887. The agency's original purpose was to regulate railroads to ensure fair rates, to eliminate rate discrimination, and to regulate other aspects of common carriers, including interstate bus lines and telephone companies. 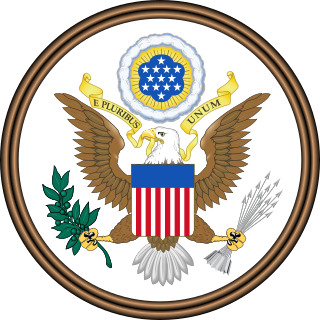 Congress expanded ICC authority to regulate other modes of commerce beginning in 1906. Throughout the 20th century several of ICC's authorities were transferred to other federal agencies. The ICC was abolished in 1995, and its remaining functions were transferred to the Surface Transportation Board. 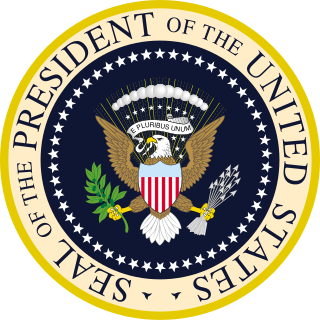 The Telecommunications Act of 1996 was the first significant overhaul of telecommunications law in more than sixty years, amending the Communications Act of 1934. The Act, signed by President Bill Clinton, represented a major change in American telecommunication law, since it was the first time that the Internet was included in broadcasting and spectrum allotment. The Government Performance and Results Act of 1993 (GPRA) is a United States law enacted in 1993, one of a series of laws designed to improve government performance management. The GPRA requires agencies to engage in performance management tasks such as setting goals, measuring results, and reporting their progress. In order to comply with the GPRA, agencies produce strategic plans, performance plans, and conduct gap analyses of projects. The GPRA of 1993 established project planning, strategic planning, and set up a framework of reporting for agencies to show the progress they make towards achieving their goals. † Commissioners may continue serving until the appointment of their replacements. However, they may not serve beyond the end of the next session of Congress following term expiration. In practice, this means that commissioners may serve up to 1 1/2 years beyond the official term expiration dates listed above if no replacement is appointed. This would end on the date that Congress adjourns its annual session, generally no later than noon on January 4. The FCC is organized into seven Bureaus,  which process applications for licenses and other filings, analyze complaints, conduct investigations, develop and implement regulations, and participate in hearings. The FCC has eleven Staff Offices. The FCC's Offices provide support services to the Bureaus. David A. Bray joined the Commission in 2013 as Chief Information Officer and quickly announced goals of modernizing the FCC's legacy information technology (IT) systems, citing 200 different systems for only 1750 people a situation he found "perplexing". These efforts later were documented in a 2015 Harvard Case Study. In 2017, Christine Calvosa replaced Bray as the acting CIO of FCC. A complete list of commissioners is available on the FCC website. In addition, Frieda B. Hennock (D-NY) was the first female commissioner of the FCC. With the major demographic shifts occurring in the country in terms of the racial-ethnic composition of the population, the FCC has been criticized for ignoring the issue of decreasing racial-ethnic diversity of the media. This includes charges that the FCC has been watering down the limited affirmative action regulations it had on the books, including no longer requiring stations to make public their data on their minority staffing and hiring. In the second half of 2006, groups such as the National Hispanic Media Coalition, the National Latino Media Council, the National Association of Hispanic Journalists, the National Institute for Latino Policy, the League of United Latin American Citizens (LULAC) and others held town hall meetings  in California, New York and Texas on media diversity as its effects Latinos and minority communities. They documented widespread and deeply felt community concerns about the negative effects of media concentration and consolidation on racial-ethnic diversity in staffing and programming. At these Latino town hall meetings, the issue of the FCC's lax monitoring of obscene and pornographic material in Spanish-language radio and the lack of racial and national-origin diversity among Latino staff in Spanish-language television were other major themes. The important relationship of the FCC and the American Telephone and Telegraph (AT&T) Company evolved over the decades. For many years, the FCC and state officials agreed to regulate the telephone system as a natural monopoly. The FCC controlled telephone rates and imposed other restrictions under Title II to limit the profits of AT&T and ensure nondiscriminatory pricing. In December 2010, the FCC revised the principles from the original Internet policy statement and adopted the Open Internet Order consisting of three rules  regarding the Internet: Transparency. Fixed and mobile broadband providers must disclose the network management practices, performance characteristics, and terms and conditions of their broadband services; No blocking. Fixed broadband providers may not block lawful content, applications, services, or non-harmful devices; mobile broadband providers may not block lawful websites, or block applications that compete with their voice or video telephony services; and No unreasonable discrimination. Google, Microsoft and other companies are vying for the use of this white-space to support innovation in Wi-Fi technology. Broadcasters and wireless microphone manufacturers fear that the use of white space would "disrupt their broadcasts and the signals used in sports events and concerts." Cell phone providers such as T-Mobile USA have mounted pressure on the FCC to instead offer up the white space for sale to boost competition and market leverage. Amateur radio operators in the United States must be licensed by the FCC before transmitting. While the FCC maintains control of the written testing standards, it no longer administers the exams, having delegated that function to private volunteer organizations. No amateur license class requires examination in Morse code; neither the FCC nor the volunteer organizations test code skills for amateur licenses (commercial license examiners do test code skills for the Radiotelegraph Operator license). An FCC database provides information about the height and year built of broadcasting towers in the US. It does not contain information about the structural types of towers or about the height of towers used by Federal agencies, such as most NDBs, LORAN-C transmission towers or VLF transmission facilities of the US Navy, or about most towers not used for transmission like the BREN Tower. These are instead tracked by the Federal Aviation Administration as obstructions to air navigation. As early as 1927, there is evidence that public hearings were indeed held; among them, hearings to assess the expansion of the radio broadcast band. At these early hearings, the goal of having a broad range of viewpoints presented was evident, as not only broadcasters, but also radio engineers and manufacturers were in attendance. Numerous groups representing the general public appeared at the hearings as well, including amateur radio operators and inventors as well as representatives of radio listeners' organizations. Including members of the general public in the discussion was regarded (or at least articulated) as very important to the Commission's deliberations. In fact, FCC Commissioner Bellows noted at the time that "it is the radio listener we must consider above everyone else." Though there were numerous representatives of the general public at the hearing, some expressing their opinions to the commission verbally, overall there was not a great turnout of everyday listeners at the hearings. A few years later [ when? ], the FCC held hearings to address early cross-ownership issues; specifically, whether newspaper companies owning radio stations was in the public interest. These "newspaper divorcement hearings" were held between 1941 and 1944, though it appears that these hearings were geared mostly towards discussion by industry stakeholders. Around the same time, the Commission held hearings as a part of its evaluation of the national television standard,  and in 1958 held additional hearings on the television network broadcasting rules. Though public hearings were organized somewhat infrequently, there was an obvious public appeal. In his now famous "vast wasteland" speech in 1961, FCC Chairman Newton Minow noted that the commission would hold a "well advertised public hearing" in each community to assure broadcasters were serving the public interest,  clearly a move to reconnect the Commission with the public interest (at least rhetorically). 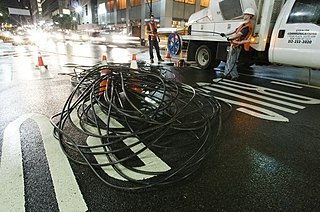 Wireless broadband is telecommunications technology that provides high-speed wireless Internet access or computer networking access over a wide area. The term comprises both fixed and mobile broadband. 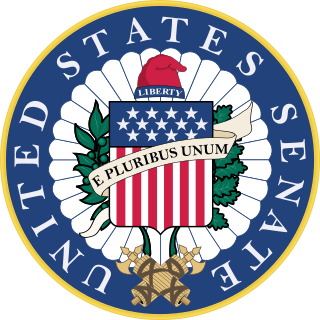 The All-Channel Receiver Act of 1962 (ACRA), commonly known as the All-Channels Act, was passed by the United States Congress in 1961, to allow the Federal Communications Commission to require that all television set manufacturers must include UHF tuners, so that new UHF-band TV stations could be received by the public. This was a problem at the time since the Big Three television networks were well-established on VHF, while many local-only stations on UHF were struggling for survival. A broadcast license is a type of spectrum license granting the licensee permission to use a portion of the radio frequency spectrum in a given geographical area for broadcasting purposes. The licenses generally include restrictions, which vary from band to band. National Cable & Telecommunications Association v. Brand X Internet Services, 545 U.S. 967 (2005), is a United States Supreme Court case in which the Court declared in a 6–3 decision that the administrative law principle of Chevron deference to statutory interpretations by administrative agencies tasked with executing the statute trumped the precedents of the United States Courts of Appeals unless the Court of Appeals had held that the statute was "unambiguous" under Chevron. The Supreme Court therefore upheld the Federal Communications Commission's determination that a cable Internet provider is an "information service", and not a "telecommunications service" and as such competing internet service providers (ISPs) like Brand X Internet were denied access to the cable and phone wires to provide home users with competing internet service. A spectrum auction is a process whereby a government uses an auction system to sell the rights (licenses) to transmit signals over specific bands of the electromagnetic spectrum and to assign scarce spectrum resources. Depending on the specific auction format used, a spectrum auction can last from a single day to several months from the opening bid to the final winning bid. With a well-designed auction, resources are allocated efficiently to the parties that value them the most, the government securing revenue in the process. Spectrum auctions are a step toward market-based spectrum management and privatization of public airwaves, and are a way for governments to allocate scarce resources. Alternatives to auctions include administrative licensing, such as the comparative hearings conducted historically, or lotteries. Spectrum management is the process of regulating the use of radio frequencies to promote efficient use and gain a net social benefit. The term radio spectrum typically refers to the full frequency range from 3 kHz to 300 GHz that may be used for wireless communication. Increasing demand for services such as mobile telephones and many others has required changes in the philosophy of spectrum management. Demand for wireless broadband has soared due to technological innovation, such as 3G and 4G mobile services, and the rapid expansion of wireless internet services. In telecommunications, white spaces refer to frequencies allocated to a broadcasting service but not used locally. The United States 700 MHz FCC wireless spectrum auction, officially known as Auction 73, was started by the Federal Communications Commission (FCC) on January 24, 2008 for the rights to operate the 700 MHz radio frequency band in the United States. The details of process were the subject of debate among several telecommunications companies, including Verizon Wireless, AT&T Mobility, as well as the Internet company Google. Much of the debate swirled around the "open access" requirements set down by the Second Report and Order released by the FCC determining the process and rules for the auction. All bidding was required by law to commence by January 28. Julius Genachowski is an American lawyer and businessman. He became the Federal Communications Commission Chairman on June 29, 2009. On March 22, 2013, he announced he would be leaving the FCC in the coming weeks. On January 6, 2014, it was announced that Genachowski had joined The Carlyle Group. The Federal Communications Commission Open Internet Order is a set of regulations that move towards the establishment of the internet neutrality concept. Some opponents of net neutrality believe such internet regulation would inhibit innovation by preventing providers from capitalizing on their broadband investments and reinvesting that money into higher quality services for consumers. Supporters of net neutrality argue that the presence of content restrictions by network providers represents a threat to individual expression and the rights of the First Amendment. Open Internet strikes a balance between these two camps by creating a compromised set of regulations that treats all internet traffic in "roughly the same way". In Verizon v. FCC, the Court of Appeals for the D.C. Circuit vacated portions of the order that the court determined could only be applied to common carriers. Communications law refers to the regulation of electronic communications by wire or radio. It encompasses regulations governing broadcasting, telephone and telecommunications service, cable television, satellite communications, wireless telecommunications, and the Internet. 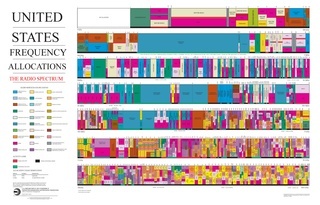 Middle 20th century frequency allocation assigned much of the radio spectrum to broadcasting. Late in the century, other uses arose and in United States, spectrum reallocation mostly refers to reassigning frequency bands to uses such as wireless broadband, trunking, or point-to-point microwave services. Verizon Communications Inc. v. Federal Communications Commission was a 2014 U.S. Court of Appeals for the D.C. Circuit case vacating portions of the FCC Open Internet Order 2010 that the court determined could only be applied to common carriers. The court ruled that the FCC did not have the authority to impose the order in its entirety. Because the FCC had previously classified broadband providers under Title I of the Communications Act of 1934, the court ruled that the FCC had relinquished its right to regulate them like common carriers. The case was largely viewed as a loss for network neutrality supporters and a victory for the cable broadband industry. Of the three orders that make up the FCC Open Internet Order 2010, two were vacated and one was upheld (transparency). Judge David S. Tatel wrote the opinion with Judge Judith Ann Wilson Rogers joining. Judge Laurence H. Silberman wrote a separate decision concurring in part and dissenting in part. ↑ "Employee Profile at the FCC". FCC. January 4, 2016. Retrieved May 10, 2017. ↑ 2016 Budget Estimate FCC Budget Estimates. FCC. 1 2 Cecilia Kang (October 31, 2011). "Obama names FCC commissioners, both agency, Hill veterans". The Washington Post; Post Tech. Retrieved November 1, 2011. 1 2 "2008 Performance and Accountability Report" (PDF). Federal Communications Commission. September 2008. 1 2 "Strategic Plan 2018-2022". Federal Communications Commission. 2018-02-12. Retrieved 2018-09-19. ↑ "FCC Commissioners". FCC. Retrieved July 18, 2007. 1 2 "FCC Bureaus & Offices" . Retrieved June 6, 2013. ↑ "FCC Opens Bureau of Public Safety and Homeland Security". PCMAG. Retrieved November 19, 2015. ↑ FCC Ends Long Fight, Will Move to Southwest D.C. The Washington Post . January 24, 1996. Financial F01. Retrieved March 5, 2010. ↑ "Order Containing Regulations" Report on Chain Broadcasting: May 1941, pages 91-92. ↑ Clarke Ingram, "The DuMont Television Network: Historical Web Site" Archived August 4, 2009, at the Wayback Machine . Retrieved February 1, 2009. ↑ Gomery, Douglas. "Television Sweeps the Nation: The Story Behind the Pioneering Post-"Freeze" Stations" (From the W. D. "Dub" Rogers, Jr. Television Collection)". South Plains College . Archived from the original on January 16, 2009. Retrieved June 21, 2008. ↑ "Robert W. Crandall". The Brookings Institution. Archived from the original on November 2, 2007. ↑ "Local Community Radio Act of 2009". Govtrack.us. October 29, 2009. ↑ FCC Oversight Hearing (September 17, 2009). "FCC: Unanimous, bipartisan support for LPFM". ↑ Rachel M. Stilwell, "Which Public - Whose Interest - How the FCC's Deregulation of Radio Station Ownership Has Harmed the Public Interest, and How We Can Escape from the Swamp," 26 Loy. L.A. Ent. L. Rev. 369, March 1, 2006. ↑ Oxenford, David (February 9, 2011). "Broadcast Law Blog: On the 15th Anniversary of the Telecommunications Act of 1996, The Effect on Broadcasters is Still Debated". ↑ See Rachel M. Stilwell, 26 Loy. L.A. Ent. L. Rev. 369, supra. ↑ "FCC Names New CIO and Acting Director". FedScoop Magazine. ↑ "FCC Commissioners 1934-present". FCC. Retrieved 6 May 2016. ↑ Skretvedt, Randy (October 5, 2018). "Radio: The Need for Regulation". Encyclopædia Britannica. Retrieved October 24, 2018. ↑ Nekesa Mumbi Moody (February 3, 2004). "Janet Jackson Apologizes for Bared Breast". Associated Press. Archived from the original on February 3, 2004. ↑ Ahrens, Frank (June 8, 2006). "The Price for On-Air Indecency Goes Up". The Washington Post . Retrieved June 27, 2009. ↑ "Bill Number S. 193". Broadcast Decency Enforcement Act of 2005 (Introduced in Senate) from Congressional THOMAS DB. Archived from the original on September 16, 2005. Retrieved April 11, 2005. ↑ Ferris, David (October 20, 2006). "publish.nyc.indymedia.org | FCC Town Hall Meeting Marked by Concerns over Media Consolidation". Nyc.indymedia.org. Retrieved March 4, 2012. ↑ See El Diario La Prensa s editorial on media diversity. ↑ SSRC Archived August 18, 2009, at the Wayback Machine . ↑ Obama's Diversity Offensive Against Talk Radio August 30, 2009 By Christopher Ruddy Archived September 3, 2009, at the Wayback Machine . ↑ "The End of AT&T". Celnet. Celnet. Archived from the original on October 6, 2014. Retrieved October 3, 2014. ↑ Frum, David (2000). How We Got Here: The '70s. New York, New York: Basic Books. p. 327. ISBN 0-465-04195-7. ↑ "AT&T BREAKUP II : Highlights in the History of a Telecommunications Giant". latimes. ↑ Hansell, Saul (August 2, 2008). "F.C.C. Vote Sets Precedent on Unfettered Web Usage". The New York Times . ↑ "Preserving the Open Internet". fcc.gov. Archived from the original on April 27, 2014. ↑ Wyatt, Edward (November 10, 2014). "Obama Asks F.C.C. to Adopt Tough Net Neutrality Rules". The New York Times. Retrieved November 15, 2014. ↑ NYT Editorial Board (November 14, 2014). "Why the F.C.C. Should Heed President Obama on Internet Regulation". The New York Times. Retrieved November 15, 2014. ↑ Sepulveda, Ambassador Daniel A. (January 21, 2015). "The World Is Watching Our Net Neutrality Debate, So Let's Get It Right". Wired . Retrieved January 20, 2015. ↑ Staff (February 26, 2015). "FCC Adopts Strong, Sustainable Rules To Protect The Open Internet" (PDF). Federal Communications Commission. Retrieved February 26, 2015. ↑ Ruiz, Rebecca R.; Lohr, Steve (February 26, 2015). "In Net Neutrality Victory, F.C.C. Classifies Broadband Internet Service as a Public Utility". The New York Times. Retrieved February 26, 2015. ↑ Flaherty, Anne (February 25, 2015). "FACT CHECK: Talking heads skew 'net neutrality' debate". AP News . Retrieved February 26, 2015. ↑ Takala, Rudy (May 9, 2016). "Is online free speech under attack?". Washington Examiner . ↑ Liebelson, Dana (February 26, 2015). "Net Neutrality Prevails In Historic FCC Vote". The Huffington Post . Retrieved February 27, 2015. ↑ Ehrenfreund, Max. "New poll: Republicans and Democrats both overwhelmingly support net neutrality". Washington Post. ↑ Ruiz, Rebecca R. (March 12, 2015). "F.C.C. Sets Net Neutrality Rules". The New York Times. Retrieved March 13, 2015. ↑ Sommer, Jeff (March 12, 2015). "What the Net Neutrality Rules Say". The New York Times. Retrieved March 13, 2015. ↑ FCC Staff (March 12, 2015). "Federal Communications Commission - FCC 15-24 - In the Matter of Protecting and Promoting the Open Internet - GN Docket No. 14-28 - Report and Order on Remand, Declaratory Ruling, and Order" (PDF). Federal Communications Commission. Retrieved March 13, 2015. ↑ Reisinger, Don (April 13, 2015). "Net neutrality rules get published -- let the lawsuits begin". CNET . Retrieved April 13, 2015. ↑ Federal Communications Commission (April 13, 2015). "Protecting and Promoting the Open Internet - A Rule by the Federal Communications Commission on 04/13/2015". Federal Register . Retrieved April 13, 2015. ↑ Federal Communications Commission (April 27, 2017). "Fact Sheet: Restoring Internet Freedom" (PDF). FCC . Retrieved May 17, 2017. ↑ Kang, Cecilia (2017-12-14). "F.C.C. Repeals Net Neutrality Rules". The New York Times. ISSN 0362-4331 . Retrieved 2017-12-14. ↑ Walker, Dale; Hopping, Clare (June 12, 2018). "Net neutrality laws are now officially dead". IT Pro. Retrieved 18 June 2018. ↑ "FCC admits it was never actually hacked". TechCrunch. Retrieved 2018-08-07. ↑ FCC Refuses to Investigate NSA Program, Predicting Likely Administration Road Blocks Edward J. Markey. May 23, 2006. ↑ Olga Kharif (October 15, 2008). "FCC's Kevin Martin Supports Freeing White Spaces". Business Week. Retrieved October 15, 2008. ↑ David Gonzalez (October 15, 2008). "FCC Chairman Kevin Martin wants to allow the use of portable devices on white spaces". UnWiredView.com. Archived from the original on October 17, 2008. Retrieved October 15, 2008. ↑ Marguerite Reardon (November 4, 2008). "FCC opens free 'white space' spectrum". CNET . Retrieved November 5, 2008. ↑ FCC opens up wireless 'white spaces;' Assessing winners, losers and wild-cards November 5, 2008. ↑ ASR Registration Search. Retrieved November 4, 2009. ↑ Stimson, Leslie (November 6, 2013). "IBiquity Illuminates License Fees". Radio World. Archived from the original on November 11, 2013. Retrieved November 11, 2013. ↑ Greer, Clarke; Ferguson, Douglas (2008). "Factors Influencing the Adoption of HD Radio by Local Radio Station Managers". The International Journal on Media Management. doi:10.1080/14241270802426725. Archived from the original on November 11, 2013. Retrieved November 11, 2013. ↑ McCullagh D (November 7, 2008) Democratic win could herald wireless Net neutrality. CNET, viewed 2010-06-01. ↑ Brodkin, Jon (September 20, 2013). "Verizon blocks Nexus 7 and will probably get away with it". Ars Technica. Retrieved November 11, 2013. ↑ Obar, Jonathan, A.; Schejter, A.M. (2010). "Inclusion or illusion? An analysis of the FCC's". Journal of Broadcasting and Electronic Media. 54 (2): 212–227. doi:10.1080/08838151003735000. ↑ "Legal Websites and Information". Federal Communications Commission. Retrieved March 3, 2014. ↑ "Federal Communications Commission Record". University of North Texas Libraries . Retrieved March 3, 2014. 1 2 3 Moss, D.A. ; Lackow, J.B. "Rethinking the role of history in law & economics: the case of the Federal Radio Commission in 1927 (working paper)". SSRN 1220743 . ↑ Mazzocco, D. "Radio's New Deal: The NRA and U.S. Broadcasting, 1933–1935". Journal of Radio Studies. 12 (1): 32–46. doi:10.1207/s15506843jrs1201_4. ↑ Risley, F. (1995). "A First Step: The FCC's Investigation Into Newspaper Ownership of Radio Stations". Journal of Radio Studies. 3: 118–129. doi:10.1080/19376529509361978. ↑ Slotten, H. (2000). Radio and Television Regulation. Baltimore: Johns Hopkins University Press. ↑ Barrow, R (1957). "Network Broadcasting – The Report of the FCC Network Study Staff". Law and Contemporary Problems. 22: 611–625. ↑ Minow, N (2003). "Television and the Public Interest". Federal Communications Law Journal. 55: 395–406. Wikimedia Commons has media related to Federal Communications Commission .